Today is Valentine’s Day (ok, actually for me it will be tomorrow since I am writing this on Sunday the 13th for it to post tomorrow) but when you get this, it will be so….Happy Valentine’s Day! Each year as we approach this day, the word “love” begins to get a lot more attention than it does most other times of the year. Different people delineate the day in a large variety of ways so there really isn’t a set way to celebrate it or a pure definition for what it is-so to put it simply, it is a day set aside to acknowledge and honor those that we love in all the different ways we love somebody. For some men, it is a time of dread because the expectations of a girlfriend or a wife may be different from what the man had in mind. For some women, it is an anxious time-will that long-awaited proposal be forthcoming this Valentine’s Day? Will he surprise her with flowers and chocolates, that old, time-honored tradition of the day or will he truly devote the time and effort that reflects how he feels about her? We tell everyone at Christmas that it is not the gift, it’s the thought that counts but the rules are a bit different near Valentine’s Day because it’s more about the effort than the thought. I didn’t get that for a long time. In grade school, Valentine’s Day meant a class party on the day closest to it. Your mother took you to the dime store (that’s a dollar store today) and you went home with a small box of little Valentine cards, usually with some cartoonish character printed on the front and a snappy line that always said “Be my Valentine” somewhere on it. Armed with a pencil and a list of your classmates, you sat down and signed your name to each card, then you put the name of each classmate on the small enclosed envelopes and a card went into each one. For your best friends, you picked the cards you liked the best and the rest were just inserted and sealed. Licking the glue on the envelope was the first treat of Valentine’s Day or not, depending on whether you liked the taste. As my son filled out his cards last week, I was glad to see that very little had changed in this annual ritual of the cards. 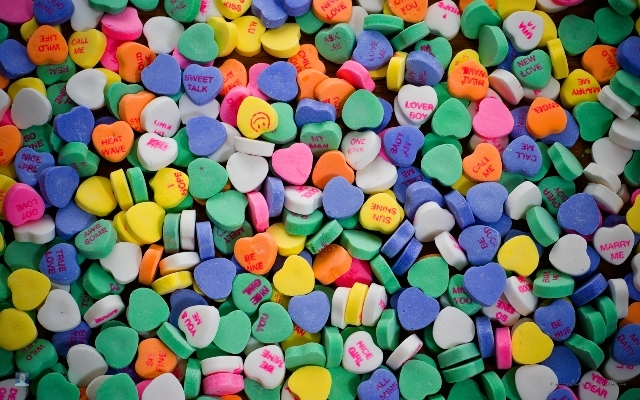 At the actual party, cupcakes and Kool-Aid would be served, plus a few of the little candy hearts that are still a staple of Valentines celebrations today. Everyone would read what their hearts said, cut up some about it and then each kid got to go around the room and distribute his or her Valentine cards to the classmates. The girls usually wrote silly stuff on their cards; the boys just did good to sign their names. Of course, since everyone’s parents took them to pretty much the same place and bought the same card packs, you were bound to get repeats of the same card-and if you got one of your favorite ones from somebody else, they went up a notch in your eyes. After high school, some got married and some didn’t but Valentine’s Day marched on and it flourished. The local florists would draft anyone who had a decent car and could tell a flower from a tree to help-either assembling the arrangements, delivering them or both. I helped one year and spent most of the afternoon assembling the same arrangement over and over from a picture provided by FTD. Phone calls went ignored at the store on that day because if you hadn’t gotten your order in before the actual day, you were pretty much out of luck or forced to come to the flower shop and pick something out of the shelves where some generic arrangements were always out. These scenarios, from grade school to high school to adulthood are still played out each year at Valentine’s Day in cities and states all over the nation but even after decades of commercialized exposure to it, do we ever really stop and think about what we are celebrating? We are celebrating love, one of the most used and least understood words in our language. I love my parents-my love for them goes back to a time before I have memory and it began as a love of dependency into a love caring and respect. Not that we always agreed, nor will we ever agree on everything but my love for my parents and let me add, my grandparents has always been constant and it is returned. I knew my parents loved me because my father got up every morning early and worked in a restaurant twelve or more hours a day, seven days a week for YEARS to support his family and make sure that we had all that we needed and a lot of things that we didn’t. My mother worked at home for the family business, juggling the financial books with raising two children and cooking meals for all of us every night. My grandparents filled in wherever the need presented itself. These figures loom large in my lifetime, for they all made sacrifices for my brother and I, big ones now and then and a whole lot of little small ones that add up over time. Even when I have failed them, they didn’t stop their love or change how they felt-it was and is a constant to this day. I love my brother-as I have said before, he is the one person that comes from the same background, genetic composition and environment as I do and who is the most like me-yet we are also very much our own person. An older brother such as I am accepts a younger brother for who he is, takes pride when he achieves something (especially if you contributed to the achievement) and teaches them all you can to help them along the way. A younger brother accepts that the older brother isn’t always right but trusts him not to steer him too far off the road. This kind of love comes from shared experiences, bonds of unerring trust and mutual respect, forged over many years. So you go along, sustained by your family and your friends and then one day you run into a different kind of love and that is the kind that brings someone into your life to share that life with you. That happened to me one day and I don’t know how I was lucky enough to find her and to find somebody that would put up with all my bad habits. She has hung in there through good times and bad times and I won’t embarrass her too much by going into all the things that I love about her but I hope she knows that I love her and I hope she knows why I love her. Ok, I’ll go into a few things. One, she is protective of the people she loves and she is loyal to a fault. If I ever find myself going into a fight, she is the one I want by my side. Two, she has always been supportive of me in whatever I have tried to do, be it work, community or wanting to write. It’s easy for some people to rain on other people’s parade but not her-she is encouraging and supportive to me. Third, I love to hear her laugh, see her smile and watch her when she does both. After all these years she still laughs at some of the things I say and I am determined to keep coming up with new material for her. Four, I love her for the way she tries to do things where they are needed, even when she is tired, like helping with programs at church and giving of her time and talent that way. Fifth, I love her as a mother to our child and being a mother suits her. As my wife, I don’t tell her often enough how much I appreciate who she is and what she means to me. Finally, I love my son. There is nothing in the world that can compare to the love one has for their children except maybe how wonderful it is to have that loved returned tenfold. At his current age, he is always happy to see me, always wants to spend time with me, always wants me to tell him about things and always wants to impress me with what he has learned to do each day. I didn’t care whether he was a boy or a girl when he was “baking”; all I wanted was a happy and healthy child and that’s what I got but I have always thought God threw in a lot of extras with him and I am even more grateful for that. Children can make the things that look old and overly familiar to you become brand-new again when seen through their eyes and it helps you to gain a new perspective. It’s also very satisfying when I see traces of myself-and occasionally, outright duplication-in something that he says and does, or even an expression he makes-but sometimes it reminds you that you have habits and mannerisms that you would prefer NOT to pass on to him. No matter how you cut it though, it’s always fresh and new, an experience I wouldn’t trade for anything. You only think you know the meaning of unconditional love until you have a child; then the meaning really becomes clear. Valentine’s Day is about love, in all its many forms, in all the ways it can be expressed and in all the meanings it has for each one of us. I reminded the congregation at First Methodist this morning that love is never meant to be kept to one’s self; it is meant to be shared with others, invested in others and in doing so, you make an investment that pays the best dividends you could ever hope for. Have a wonderful Valentine’s Day! Love you babe. Happy Valentine’s Day! I loved the list best of all – you frequently manage to make me tear up and this is one of those occasions. Thank you, Michael! Thank you Rosalie….I appreciate your interest in my writings and will try not to turn you into a southerner too quickly!